Choose from 100% Genuine Leather Dice Cups and Vinyl Dice Cups each with five 5/8" white dice. We also carry Circular Wooden Dice Trays, which feature a casino green felt lining and bottom pads to protect your playing surface. Each Dice Cup comes ready for play with five 5/8" regulation dice. All our Dice Cups are in stock for fast shipment. Our Black Leather Dice Cups are top-of-the-line, featuring a 100% genuine leather shell. Each Leather Dice Cups has a ribbed, padded interior and comes with five white 5/8" Dice. These Jumbo Black Leather Dice Cups measure a whopping 4-1/8" wide at the top by 5-1/16" high. 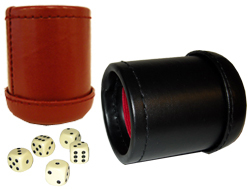 The Large Leather Dice Cups are top-of-the-line, featuring a 100% genuine leather shell. 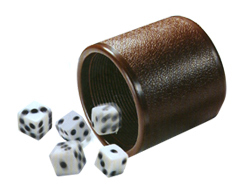 Each Leather Dice Cup has a ribbed, padded interior and comes with five oversized 1" white dice with black spots. 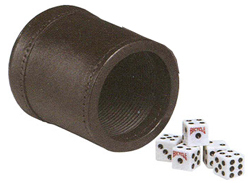 These Leatherette Dice Cups have a textured vinyl wrap that gives the outside of the Cup the look of leather. The Cups feature a red padded felt interior, and they come with five 5/8" white Dice. Available in Black or Cranberry Red. Sale Price: $6.95. Was $16.50. Save 58%! Aviator Brand Vinyl Dice cups are made in the USA from quality materials. 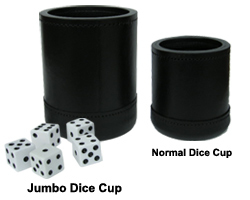 These cups feature a textured, vinyl exterior, ribbed interior, and come complete with 5 5/8" regulation sized dice. 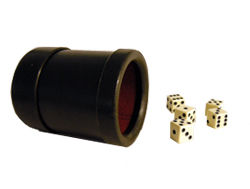 Vinyl Dice Cups – "Vegas Style"
Our Black Vinyl Dice Cups have a textured, synthetic leather exterior with a ribbed interior. These economical Dice Cups come complete with five 5/8" white Dice. 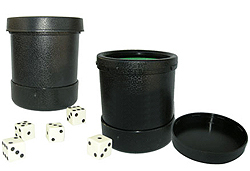 Our Black Plastic Dice Cups have a textured, exterior and a green padded/felt lined interior. Each Dice Shaker Cup comes complete with five 5/8" white Dice. Crap Dice Boats, Dice Sticks, Table Brushes, Chip Racks and More! 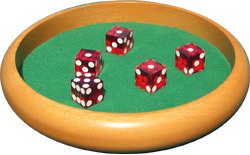 Choose from our complete line of Craps Supplies, including Wooden Chip Racks, Rattan Dice Sticks, Table brushes and many other Craps Accessories. We carry hard wood dice bowls and clear acrylic dice bowls. Each dice boat measures 7-1/4" long. Our Dice Trays are made of fine hard wood and measure 8-5/8" in diameter. Each tray is lined with casino green felt and features bottom pads to secure the tray and protect your playing surface. Dice are sold separately.